Kota, Rajasthan : Another medical aspirant allegedly committed suicide on Sunday at her accommodation in Rajiv Gandhi Nagar here due to “study pressure”. This is the fourth such suicide in one month by an aspirant in Kota, one of the hubs for coaching centres of the country. Anjali Anand, 18, of Muradabad in Uttar Pradesh, who was taking classes for AIPMT in a premier coaching institute here, took the extreme step in the morning at her hostel room here by hanging self from the ceiling fan, police said. A suicide note was found written in her diary, which stated that she ended her life due to “stress about studies” and her “inability” to fulfil her parents’ dream, the police said. According to the Anjali’s parents, she took the extreme step due to tension about studies, police said. The body has been kept in the mortuary of Maharao Bhim Singh (MBS) hospital for a post-mortem. Anjali had failed in her fist attempt in AIPMT last year and was preparing for the second attempt, SI Meghwanshi said. A case under section 174 would be lodged in this connection after the investigation into the matter is over, Meghwanshi said. 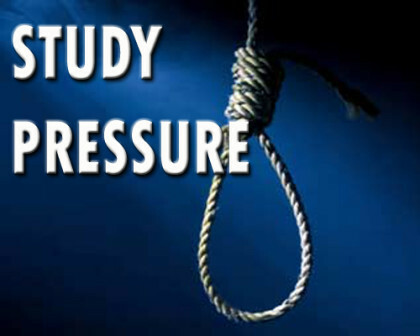 On the night of October 27, an AIPMT aspirant Vikas Meena (17) ended his life by hanging himself with a plastic pipe to the ceiling of his rented hostel room in the Talwandi area. Meanwhile, amid rising alarm of suicide deaths due to study pressure, Allen Career Institute has issued helpline number for the counselling of the students, who are undergoing stress, depression or pressure.